FLORHAM PARK, N.J. (AP) — The New York Jets‘ starting QB is TBD for Sunday. 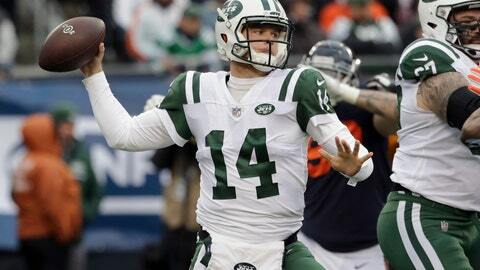 It would appear the choice will come down to either Darnold or McCown, especially since Webb hasn’t yet taken a regular-season snap in the NFL and was on the practice squad until Darnold was hurt. Darnold has missed the past two games with a strain in his right foot. He showed progress Wednesday by participating in team drills for the first time since being injured against Miami on Nov. 4. Bowles said Darnold had no soreness in the foot Thursday, and wouldn’t rule out starting the rookie even if he’s limited Friday. McCown is dealing with a sore hand and back. His right hand was cut when he banged it on a helmet during the Jets’ loss last Sunday to New England. McCown played through it, though, and could be in line for his third straight start if Darnold isn’t ready to play. Bowles didn’t seem overly concerned about the quarterback situation and whether it puts the Jets in a tough situation by having two of them limited at practice at this point in the practice week. Andre Roberts, New York’s primary returner on special teams, was limited with a foot issue — a new injury Thursday. On defense, it appears safety Marcus Maye will miss his second straight game with shoulder and thumb injuries. He didn’t practice again Thursday and Bowles acknowledged “it doesn’t look good” for the second-year player’s chances of playing.